Questions and answers about INDIGO DYEING. Your dye kit comes complete with a load of supplies and materials that you can use to make designs on fabrics. Some parts of the process are complex and we may not have had room in the printed instructions included to go in depth. If you have a question that has not yet been answered to your satisfaction, ask away! Thank you! Your question has been received. We'll get back to you with a posted answer here as soon as possible. Q: Will sun fade the indigo? I noticed my indigo was a lot darker when I first placed it on the line to dry. A: Yes, sun will naturally fade indigo. However, it takes days, weeks and months of UV exposure to remove substantial amounts of color. It sounds like you're describing the process of lightening that naturally happens when the piece dries out. Wet indigo dyed textiles always appears darker than the same fabric when dry. I recommend two or three more dips in the indigo vat AFTER you see the fabric reach the shade that you want. Re: actual sun fading of indigo dyed textiles : In John Marshall’s book Singing The Blues (which I highly recommend as a practical guide to working with indigo), he published photos of fabrics that have been exposed to comparable amounts of sunlight. One piece of fabric had been treated with a soy-milk after bath, the other received no such treatment. The fabric which received a layer of soy milk following dyeing was appreciably better at resisting the UV fading effects of the sun. I’m now firmly in support of dipping all my own indigo dyed textiles in a solution of soy milk (I’ll make my own from whole soy beans if I have the time, but will also use pure, no-sugar-or-flavor-added bottled soymilk) after their pH balancing rinse and allowing the soy to dry on the fabric. I won’t wash the item for a month to allow the soy to properly cure onto the fabric. 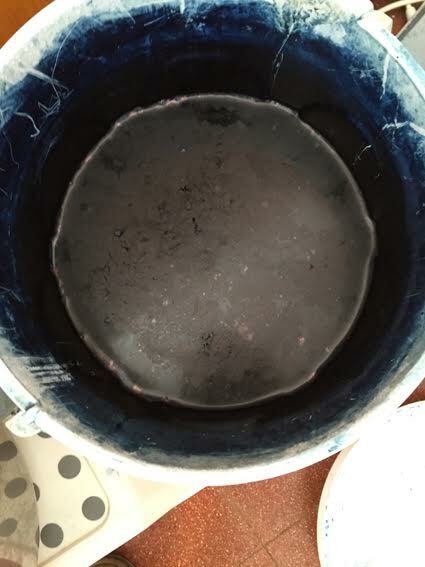 Q: How do I dispose of my indigo vat? A: Your natural dye kit indigo vat contains these three ingredients : Indigo Pigment (an organic molecule), Ferrous Sulfate (100g) and Hydrated Lime (150g). Both of these compounds are traditional soil amendments for trees and lawns. When your vat is exhausted (you've pulled all the pigment out that you can) whisk air into the vat (a huge no-no when you're trying to dye). This will introduce Carbonic Acid (dissolved Carbon Dioxide) into the solution, neutralizing the pH and converting most of the Lime to Gypsum. 2) If you do not have available green space, or are on a municipal sewage system : Allow your whisked vat to settle out. Pour the opaque blue liquid down the toilet being careful not to allow sediment to flow out. Dispose of the remaining chalky sediment in the trash. Q: How many times do I have to dip to get a super dark indigo?! A: This dip-o-meter was produced using the Indigo & Shibori Kit. As you can see, each dip adds a bit more pigment to the piece. The earlier dips were as short as 20 seconds, while the later dips lasted as long as 10 minutes. Q: I purchased a Indigo dye From Dharma Trading which is supplied by Jacquard company and the dye flower did not form very well and I found that the pieces that I dyed faded out almost to white which was very strange, after creating beautiful pieces, this was heartbreaking! So don't know if that was inferior dye or ash or what it could be?! Since I already have a vat going do you think I should just add the items in your kit to my present vat or start over! A: The three ingredients that Jacquard uses for their vat are synthetic pre-reduced Indigo (blue bottle), Soda Ash (Granular white powder) and Thiourea Dioxide (Thiox, finer white powder). I have to assume, because your flower didn't form well and your pigment washed out, that your problem was with the Thiox, which is the reducing agent in the vat. Its job is to modify the indigo molecule so that it will elect to bond with your fabric. If this chemical is compromised, your pigment will never be fully reduced and your vat will not turn yellow/green. The strength of thiox will degrade when it is exposed to air. Perhaps your baggie of it was old, a bad batch, or wasn't tightly sealed. Q: Is natural indigo safe to use on baby clothing and accessories? I was hoping to dye some onesies and swaddles with the indigo. 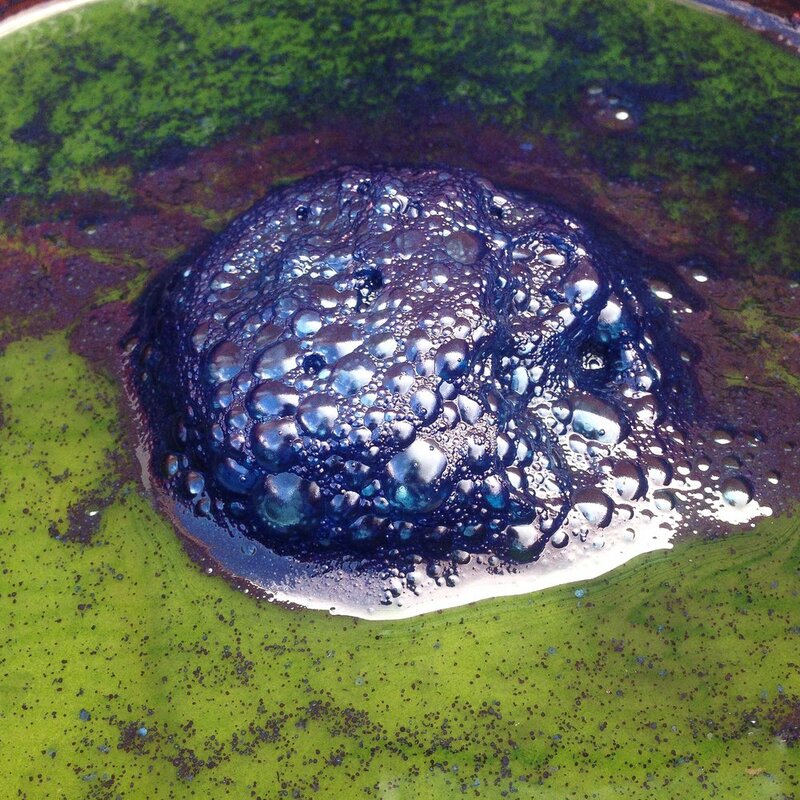 A: In all my years of experience researching and working with Indigo, I have never heard of any allergies or even cautions for humans for any age regarding the natural indigo pigment molecule. The kits have been used at many a baby shower and dyed countless onesies, blankets and sheet sets.